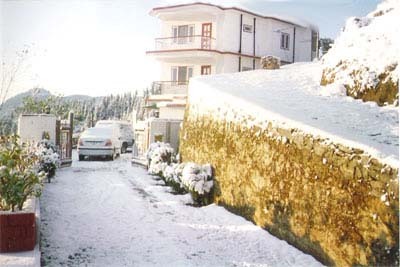 Valley facing hotel the Cedar Grand is situated in the heart of Shimla city. Hotel Cedar Grand is a three star hotel that overview breathtaking views of great Himalayan Cedar forest. The hotel Cedar Grand is centrally located at cart road near bus stand Shimla. The mall road is at walking distance from the hotel. Hotel is easily accessible to all places of tourist’s interest and destinations. The surroundings of hotel are covered with panoramic sights. Hotel the Cedar Grand has 29 well furnished rooms with all modern amenities and deluxe facilities. The hotel offers comfortable stay for your vacations. All rooms of Hotel the Cedar Grand are valley facing with awesome views of lush green valleys and Himalayan ranges. Well cleaned washrooms are attached with all the rooms where hot and cold water is running round the clock. Hotel Cedar Grand has a multi cuisine restaurant that serves delicious Indian, Chinese and Continental cuisines to its guests. Room service is also available; you can make order to room also. Sunrise Travels Shimla team visited hotel The Cedar Grand personally and found that all rooms are well maintained that gives a comfortable stay. The hotel is best in cleanliness. Well trained staff and good hospitality worth the value you pay for. Actual photographs taken by our Travel team are displayed above on the right side.